If there is one vegetable most kids didn't like, it would have to be Brussels Sprouts. Thankfully as we get older our taste buds mature and with it, learn to enjoy (and love!) 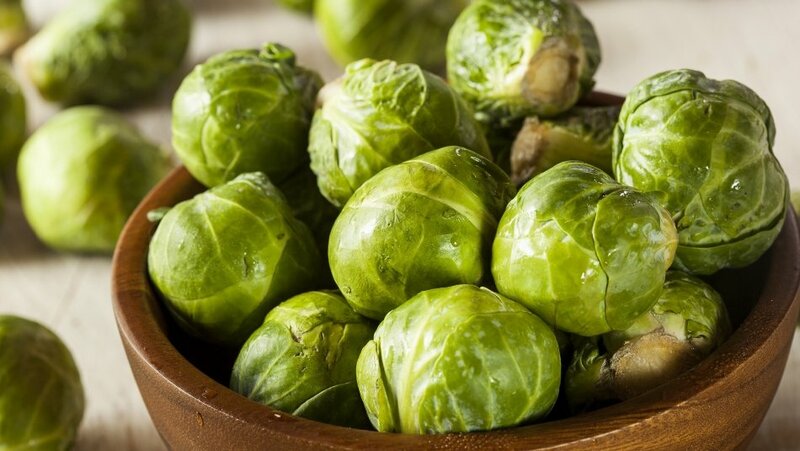 the taste of cruciferous vegetables like Brussel sprouts. These miniature cabbages are not only delicious (especially when they are roasted with olive oil as a side dish), but they are packed full of amazing health benefits like dietary fiber, vitamin A, vitamin K, vitamin C, vitamin b6, and free radicals. These little greens have the power to fight heart disease, boost your immune system and even fight off your risk of cancer. Brussels sprouts contain antioxidants, but one in particular, alpha-lipoic acid, has been shown to lower glucose levels and increase insulin sensitivity. Sounds like a good health plan to me! No need to take folic acid supplements if you are a frequent eater of Brussels sprouts. Eating foods rich in folic acid can help prevent birth defects if eaten while pregnant. While health care professionals still suggest taking a supplement while pregnant, the addition of raw Brussels sprouts to your diet would be a welcome one. Eating fiber, especially from the cruciferous vegetable family, helps keep your tummy regular and keeps your digestive system working normally. A half cup of Brussels sprouts gives you about 2 grams of daily fiber. Not only are Brussels sprouts nutrient-dense, but they also help maintain healthy blood sugar and blood pressure levels. The sprouts, which are high in fiber, slows down the absorption of sugar into the blood, which regulates it. For people who suffer from arthritis, gout or other inflammatory conditions, Brussels sprouts are the perfect anti-inflammatory vegetable to add to the dinner plate. They are said to contain glucosinolates, which regulate the body's inflammatory response. Did you know that food rich in antioxidants reduce the oxidative stress in your cells and lower your risk of chronic disease? Yes! One study has shown that one compound found in Brussels sprouts, kaempferol, may reduce cancer cell growth. One study in 2008 found that eating Brussels sprouts could protect against carcinogens. While the research is still in the early stages, scientists agree that eating Brussels sprouts are part of a balanced diet and may help prevent certain cancers. Packed full of fiber, Brussels sprouts can help with weight loss efforts by filling you up and keeping cravings at bay. Vitamin K is an essential nutrient your body needs to help form coagulation whenever you get a cut. Half a cup of cooked Brussels sprouts provides you with 137% of your daily vitamin K needs. Don't like eating seafood? Brussels sprouts are your answer. Omega-3 fatty acids have been shown to slow cognitive decline and decrease inflammation, with fresh seafood being the best place to get the fatty acids. Thankfully Brussels sprouts are a great alternative, with half a cup providing 12% of the daily requirement for women and 8% for men. Watch: 5 Okra Recipes Showcasing the Southern Delicacy's Best.